A Legal Battle Brews Over Leadership At Consumer Financial Protection Bureau : The Two-Way The outgoing leader of the Consumer Financial Protection Bureau named a replacement upon resigning. But the president has different plans, fueling a legal battle over who holds the power to appoint. White House Budget Director Mick Mulvaney speaks to media members after a House Republican Conference meeting in September. 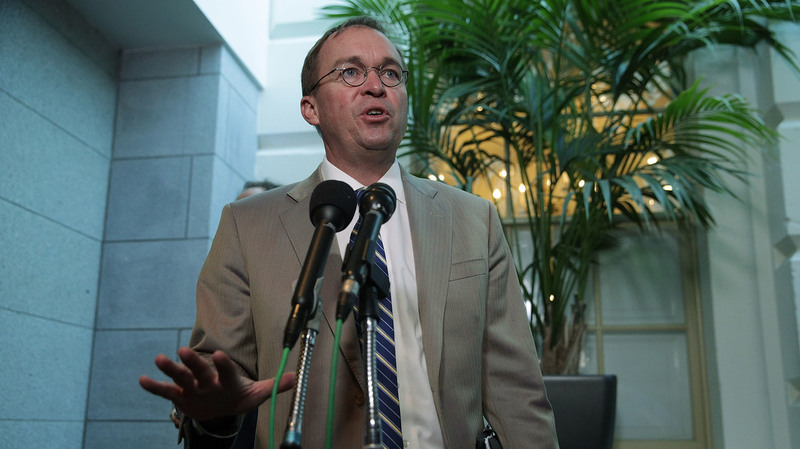 President Trump selected Mulvaney to lead the Consumer Financial Protection Bureau, a move Democrats say violates the law. "Nearly every American who deals with banks or a credit card company or has a mortgage has been affected by rules the agency put in place," says The Associated Press. Because of the agency's broad mandate, whoever is empowered as director has a huge role in deciding what or how much the organization decides to regulate. The legislation that created the agency is fairly clear in noting how a vacancy at the top of the CFPB should be filled. The deputy director "shall serve as acting director in the absence or unavailability of the director," the law says. That would put newly named Deputy Director Leandra English, who had previously served as the agency's chief of staff, into the role once Cordray's resignation became official at close of business on Friday. President Trump's White House, however, says a different law takes precedence and gives Trump the power to appoint whom he wants. Trump announced in a statement on Friday that Mick Mulvaney, the director of the White House Office of Management and Budget and someone who once called the CFPB a "sick, sad joke," would become acting director of the agency. Senior administration officials say that the Federal Vacancies Reform Act of 1998 allows the president to supersede the founding legislation of the CFPB in determining who will lead the agency until a permanent replacement is nominated by Trump and confirmed by the Senate. "We think [Mulvaney will] show up Monday and go into the office and start working," one White House official said. Democrats and progressives are unsurprisingly outraged at the move, while Republicans are drooling at the idea of overhauling an agency they've long criticized for regulation overreach. Trump tweeted his disdain for the CFPB on Saturday afternoon, saying "Financial Institutions have been devastated and unable to properly serve the public. We will bring it back to life!" Sen. Elizabeth Warren, D-Mass., proposed the creation of the agency in her previous job at Harvard Law School, before she was elected to the Senate. She says Trump "can't override" the legislation that created the CFPB. "President Trump may decide he doesn't care what Dodd-Frank says, but he doesn't get the final say," Brianne Gorod, the chief counsel at the left-leaning Constitutional Accountability Center, wrote in a blog post. "If there ends up being a dispute about who's the rightful head of the CFPB, the final say will rest with the courts." Gorod says if the courts "follow the text, structure, and history of Dodd-Frank," then English would be named acting director. But White House officials said in a conference call with reporters on Saturday that they expect English to report to work as deputy director on Monday, under Mulvaney. "With the resignation of Richard Cordray, there is now a wonderful opportunity to completely reform what has been a rogue agency that often harmed the very consumers it was charged with helping," said Rep. Jeb Hensarling, R-Texas, the chairman of the House Financial Services Committee. Prior to Mulvaney's current post in the Trump White House, he was elected to the House of Representatives in 2010, as part of the Tea Party wave that made its name by bashing the sort of regulation the CFPB was designed to recommend. The agency has taken legal action against banks, mortgage companies and myriad other financial institutions, notably fining Wells Fargo $100 million last year for secretly opening bank accounts on behalf of customers without their authorization. Whoever ends up leading the agency will serve as acting director until a new director is confirmed by the Senate, a process that could take months, or longer. Of the 613 "key positions" that are nominated by the president and that require Senate confirmation, according to The Washington Post, Trump has filled roughly a third of them in his first year in office. White House officials said Saturday they expect Trump to nominate a new CFPB director in the "upcoming weeks." Until then, it'll either be Mulvaney or English at the helm. "Everyone says the law is on their side," said NPR White House correspondent Tamara Keith, on Weekend Edition Saturday. "One thing we can be certain of is [that] there is going to be a legal fight."